Athens, where the A stands for ancient, astonishing and adventure! The city is known as the heart of Greece and represents the country’s history as well as its modern side. It holds must-see cultural gems, like the Acropolis of Athens and the Temple of Olympian Zeus. And while the gods enjoy their temples, you can have an equally amazing stay in any of the best hostels in Athens! Ladies and Gentlemen, welcome to the City Circus Athens! On tonight’s program, we’ve got a stunning view from the rooftop terrace, a quick walk to the city centre and a spectacular breakfast. Wander into this neoclassical building and gaze at the antiques, the retro furniture and the wall art. Enjoy the show from your comfortable bed and take in all the tips about what to do in Athens from the hostel’s very own travel-artists (a.k.a. the wonderful staff). And while mingling with the crowd and enjoying the atmosphere, you might find yourself dreaming about joining the circus for longer. If views are your thing, you can’t go wrong with the Pella-Inn. Here you can look right at the Acropolis, night or day, while only being a few minutes’ walk away. Enjoy it from the rooftop bar in the evenings with a little gaze and go straight to the key sight-seeing spots during your days. Meet other travellers over a beer and one thing will be clear: your adventure starts here! Do it in ‘Athenstyle’ and stay in one of the city’s top locations. The helpful staff will not only greet you with a smile but also help you to find the best things to do in Athens. You can enjoy a cheap breakfast, relax in the home cinema, cook your own meals in the kitchen and find new travel mates over a beer in the rooftop bar overlooking the iconic Acropolis. The bucks you’ll save by using the hostel kitchen can be well spent in the nearby flea market. Athenstyle is an artsy hostel with murals in the rooms, and is surrounded by cool galleries. Here you’ll find lots to see and do, as well as being close to Athens’ buzzing nightlife scene in the heart of Psyri. Artwork, new friends and amazing nightlife – what else would you want when you’re travelling solo? You might have heard about Pagration Youth Hostel. It’s recommended in many travel guides – Lonely Planet, Rough Guides and Let’s Go to name just a few. It’s a place where you can meet other people easily 24 hours a day, as there’s no curfew in their cosy open-air yard. Be ready to get a taste of the real Greece as the staff will give you an Ouzo shot on arrival to make sure you start your Athens trip right! Cheers to that (gr. Yamas)! When you wander along the famous street of Kydathineon – past cute shops, local crafts, Byzantine churches, galleries, museums, coffee shops, rooftop cinemas and fresh fruit stalls – you will soon arrive at the Students & Travellers Inn. This old, charming building in the heart of Plaka gives you a perfect base to explore the neighbourhood and to meet other travellers. Whether it’s relaxing in the cute garden bar or strolling through the vibrant neighbourhood, you’ll get to see the best of Athens here. This hostel is a vintage lover’s dream and a place for lovebirds to enjoy a quiet stay. The restored neoclassical manor in one of Athens’s coolest neighbourhoods will give you all the feels. It’s impossible not to love the cute balconies, the dreamy interior, the beautiful courtyard and the overall atmosphere. Located in a great area off the beaten track, you can discover the city on afternoon strolls or ask the friendly staff for some insider tips. Imagine waking up in a comfortable room, in your big, fluffy bed while the sun shines through your window. A breakfast buffet is waiting like an oasis of food to fuel you up for all the adventures of the day. And once you return as the sun sets, there’s a lush roof garden with drinks and an excellent view of the Acropolis and Lycavitous Hill. What sounds like the dream of a perfect holiday can be found at the Economy Hotel in Athens. And you can make this dream come true, right now! To all Aphrodites and Eros’ out there, we have a place fit for the gods of love! Step into the bright building and check into a room, a studio or even a whole apartment. All rooms are en suite and have their own balconies, so you can enjoy Athens just a few steps from your bed. The fun is right on your doorstep, as Athens Studios has its own little village, with an award-winning café and restaurant, two(!) bars and lots of fun activities, like quiz night, roof top sundowners, karaoke (to show off your angelic voice) and live music (if you’d prefer your partner not to sing anymore). You can have date night every night here! Its location in one of the best neighbourhoods, just a couple of minutes away from the main sights, means it’s up to you if you enjoy a Greek extravaganza in or around your hostel. When the hostel’s name is ‘Smallfunnyworld’ and the description mentions ‘themed rooms, a fun rooftop, delightful free breakfast and much more’, there’s no doubt that there’s a great time to be had here. 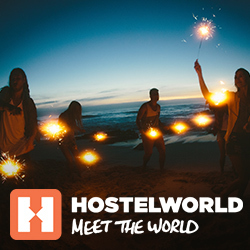 Meet your new travel mates and head out together, as the hostel is in one of Athens’ best nightlife neighbourhoods. They also offer special prices for the first guests, so make sure you roll up early. You won’t have a quiet time, but an unforgettable one for sure! Happy hour = happy times, right? Athens Backpackers is not only a place to stay but also a place to watch the sun go down from a rooftop, enjoy icy pints or free shots (or both?) and make a ton of mates. Travellers from all over the world choose this hostel close to the Acropolis and leave with a big smile and amazing memories. Guests say ‘10/10 would recommend. Great people, location, and the view from the rooftop bar is unreal’ – and this is only one of 7,000 glowing reviews! If you value excellent facilities, maximum privacy and super comfortable beds, the brand-new Nubian Hostel Athens is the place for you. The quiet rooms and relaxation areas, like the lounge in the back garden, will provide god-worthy comfort while ensuring you won’t miss out on any of the fun. The hostel is surrounded by vibrant bars and is not far from the main sights. Guests say it feels like a luxury hotel at a hostel price. Well that’s a deal we can’t resist! Have you ever had everything you need without even leaving your bed? Bedway Athens Hostel’s bunk beds have it all: a personal power supply, a light, a locker and curtains to create your own little space, so you can relax whenever you feel like it. This perk bonanza continues with a comfy lounge area, a gorgeous hostel garden where you can meet other travellers and a kitchen where you can enjoy your afternoon tea or morning coffee. In the heart of Athens, Bedbox Hostel has everything a backpacker needs. Besides being a short walk to all the main attractions, like the Acropolis, the Old Olympic Stadium or the National Garden, it’s also close to off the beaten path locations like Exarcheia and the anti-capitalist quarter which show a different side of Athens. The rooms are modern and great for meeting other travellers – or hiding from them behind your bunk bed curtains. Individual power plugs and reading lights turn your comfortable bed into a cosy little home, but the hostel’s balconies and common areas make it hard to want to stay in bed. And how does the smell of fresh coffee and free cake in the morning sound? We won’t judge if you press ‘book’ right now. So that was the best hostels in Athens! We hope we made it easy for you to find an ideal option for your time in Athens. Let us know in the comments if you stayed in one of those temples hostels or if you have a recommendation other backpacker’s shouldn’t miss.